IRWIN Marples Wood Drilling Forstner bits are constructed of tough carbon steel to stay sharp and produce precise pocket holes and flat-bottomed (blind) holes. The ultra-sharp cutting edges feature optimized angles to cut more quickly and accurately through hard and soft woods than traditional forstner bits. 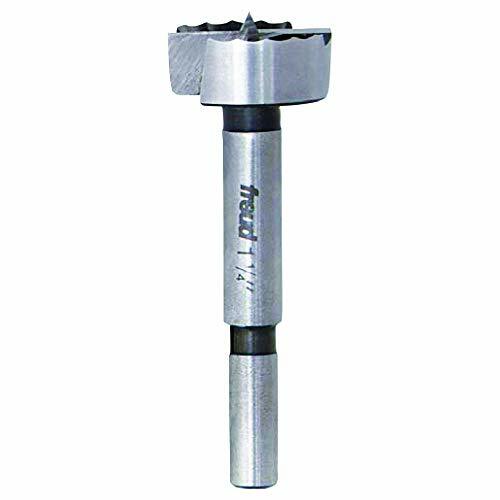 With a reduced shank, these bits fit 3/8" and larger drills and drill presses, these wood drill bits are ideal for fine woodworking, cabinet-making and more. 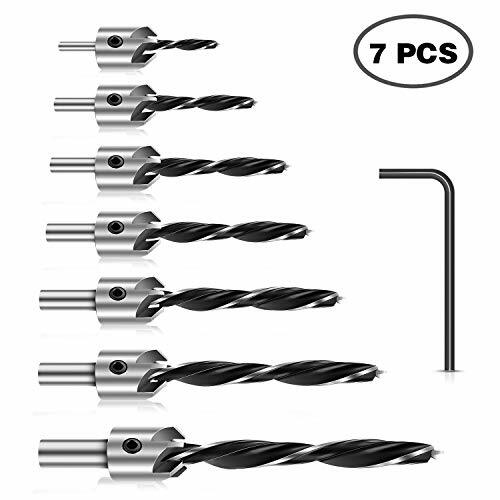 Set includes 1/4" (6.3mm), 1/4" (6.3mm), 3/8" (9.5mm), 1/2" (12.7mm), 5/8" (15.8mm), 3/4" (19.0mm), 7/8" (22.2mm), 1" (25.4mm), 1-1/8" (28.5mm), 1-1/4" (31.7mm), 1-3/8" (34.9mm), 1-1/2" (38.1mm), 1-5/8" (41.2mm), 2" (50.8mm) forstner bits. IRWIN Marples Wood Drilling Forstner bits are constructed of tough carbon steel to stay sharp and produce precise pocket holes and flat-bottomed (blind) holes. The ultra-sharp cutting edges feature optimized angles to cut more quickly and accurately through hard and soft woods than traditional forstner bits. 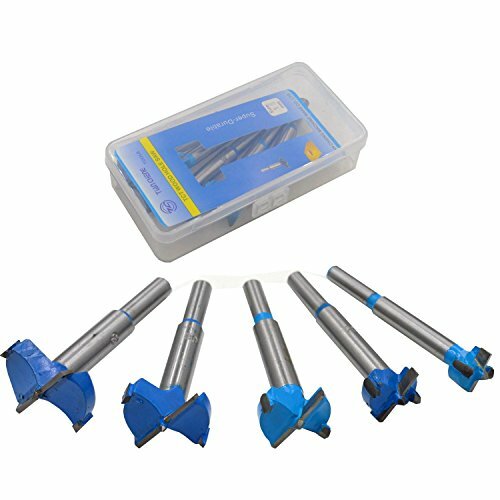 With a reduced shank, these bits fit 3/8" and larger drills and drill presses, these wood drill bits are ideal for fine woodworking, cabinet-making and more. Set includes 1/4" (6.3mm), 3/8" (9.5mm), 1/2" (12.7mm), 5/8" (15.8mm), 3/4" (19.0mm), 7/8" (22.2mm), 1" (25.4mm), 1-3/8" (34.9mm) forstner bits. 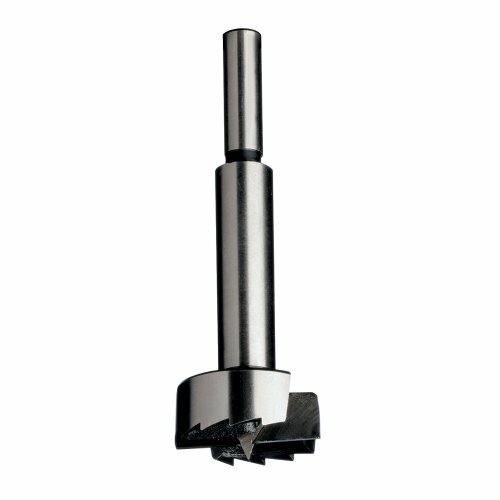 Carbide tip is specially designed to through hole cleanly in end grain and thin stock, great for boring concealed hinges and door clocks.It is far safer and more accurate to use this drill bit in a drill press. Apply to chuck is bigger than or equal to 10MM Drill, High Power Grinder, Pneumatic Drill, Magnetic Drill, Pistol Drill. Size: 15mm, 20mm, 25mm, 30mm, 35mm. Material: carbide steel (45% carbide content). It can be used for wood products perforation, mounted spherical door shoot tip, drawer, plastic products, wood, plywood, etc. It is suitable for pistol drill, bench drill, vertical drilling machine hand held electric drill, stand motor-driven drilling machine and mobile ribbon type magnetism drilling machine, etc. EXCELLENT WORKMANSHIP : Selection of high quality alloy blade, hardened and tempered, carbon HSS steel construction. Make blade more sharp and durable. It's head adopt arc curve design, beneficial to chip removal, perforation is more efficient. TOP QUALITY : Sharp edge, high hardness, accurate positioning, high precision, smooth cutting, impact resistance, high toughness. more smooth, less noise. MORE SIZE : 15mm,20mm,25mm, 30mm, 35mm. 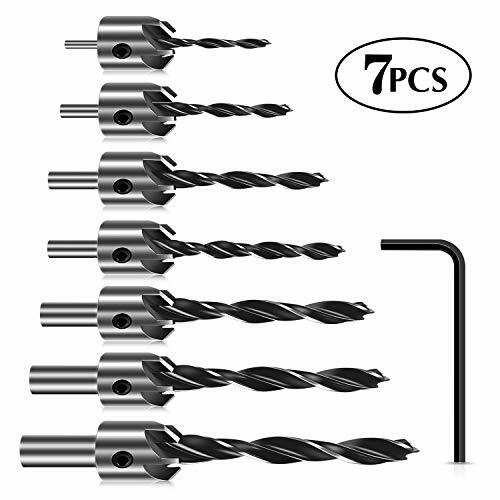 (5/8-Inch, 3/4-Inch, 7/8-Inch, 1-Inch, 1-1/8-Inch, 1-3/8-Inch). A variety of sizes to provide a choice. WIDELY USED : Can be used for wood products perforation, mounted spherical door shoot tip, drawer, plastic products, wood, plywood, etc. APPLICATION Suitable for pistol drill, bench drill, vertical drilling machine hand held electric drill, stand motor-driven drilling machine and mobile ribbon type magnetism drilling machine, etc. 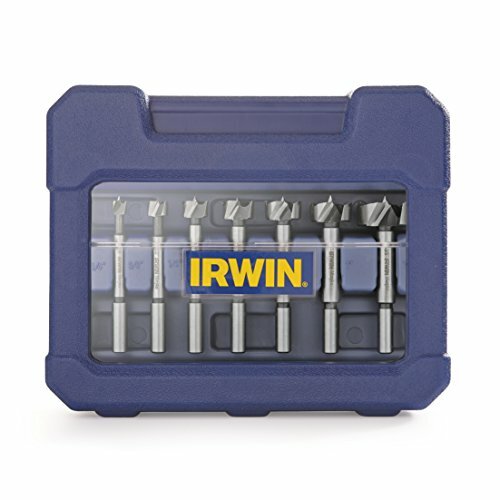 IRWIN marples wood drilling Forstner bits are constructed of tough carbon steel to stay sharp and produce precise pocket holes and flat-bottomed (Blind) holes. 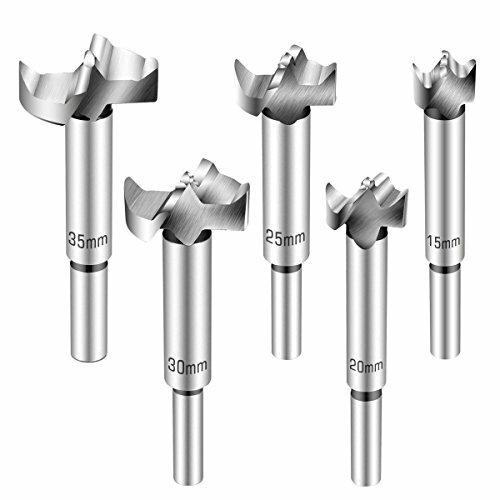 The ultra-sharp cutting teeth feature optimized angles to cut through hard and soft woods in significantly less time than traditional Forstner bits. 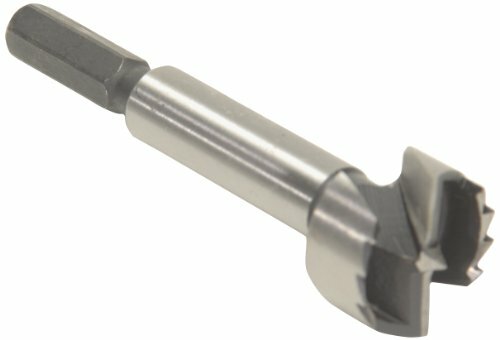 With a reduced shank, they fit 3/8" and larger drills and drill presses. 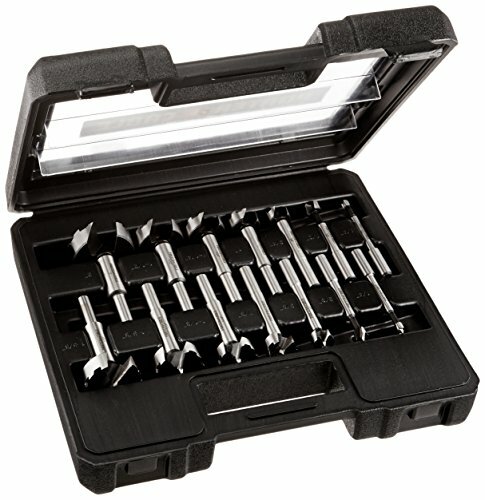 These wood drill bits are ideal for fine woodworking, cabinet-making and more. This bit comes in an individual wooden box. The head is good at removing the debris and working efficiently with curved design. 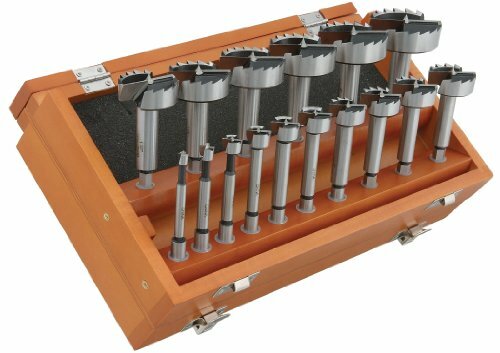 This set of woodworking Forstner Drill Bit Set is high hardness, wear resistance, good toughness, heat and corrosion. Applicable to various gypsum board, plastic board, wooden board,solid wood, artificial wood, all kinds of wood, woodworking than indispensable woodworking gadgets. 15mm 19/32" , 16mm 5/8" , 17mm 43/64" , 18mm 45/64" , 19mm 3/4" , 20mm 25/32" , 21mm 25/32" , 22mm 55/64" , 23mm 29/32" , 24mm 15/16" , 25mm 1" , 26mm 1-1 / 42" , 28mm 1-1 / 10" , 30mm 1-3 / 16" , 32mm 1-1 / 4" , 35mm 1-3 / 8" , 40mm 1-3/5"
When you using this drill bit, the materials ( wood, plastic products, plywood ect.) temperature will get very high, please add some water or coolant to avoid the material get smoke. Great quality and reliable brand. When you have purchase doubt, you can ask in the Q&A and we will answer it as soon as possible.  High quality material High quality alloy blade, hardened, tempered and carbon HSS steel construction make blade more sharp and durable.  Great performance Sharp edge, accurate positioning, high hardness, impact resistance, high precision, smooth cutting, high toughness. Forstner Drill Bits can drill clean flat bottom holes with no chipping.  Perfect Design Small incision resistance, improve the opening speed;curve design is beneficial to chip removal. Perforation is more efficient.  Application Perfect used for drawer, mounting spherical door shoot tip; perforation on wood products, plastic products etc. 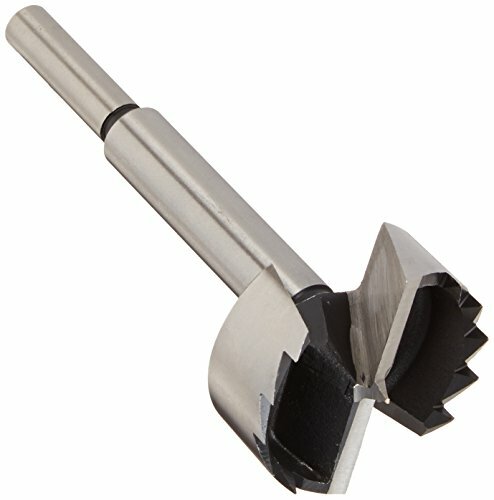 MLCS steel forstner bit extender is 5-Inch long. Extends bit approximately 3-Inch. For 3/8-Inch shank bits (MLCS forstner bits under 2-1/4-Inch cutting diameter, excluding metric sizes). 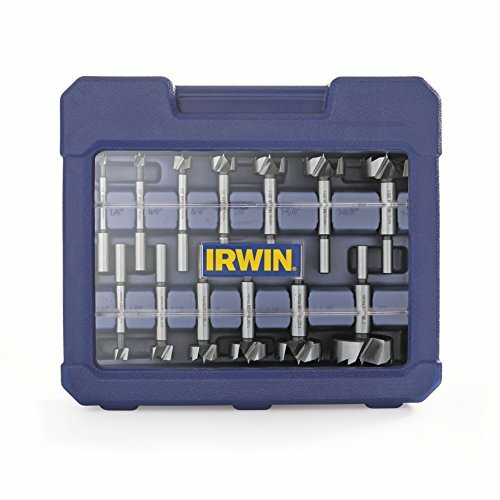 Twin locking set screws hold bit straight and true. Can piggy back if needed for greater extension. 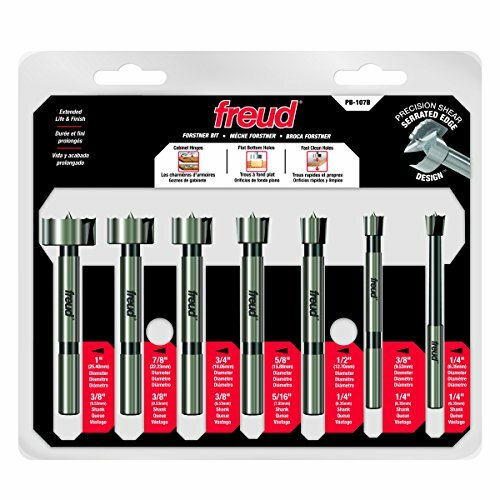 This set contains the seven smallest sizes of Freud's Forstner Bits. These bits will drill flat bottom holes, pocket holes, or over lapping holes. Part #PB-001, 1/4" dia. ; Part #PB-003, 1/2" dia. ; Part #PB-005, 3/4" dia. ; Part #PB-005, 1" dia. ; Part #PB-002, 3/8" dia. ; Part #PB-002, 3/8" dia. ; Part #PB-004, 5/8" dia. ; Part #PB-006, 7/8" dia. Steep Angled Cutting Edges - produce holes that are smooth and flat, and create chisel-like curls for fast, clean chip removal. Furniture from chair legs to tables need holes drilled into them. Forstner bits get those holes drilled. 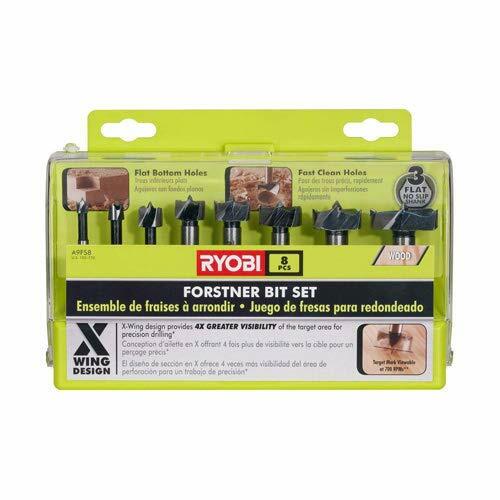 Ryobi forstner bits get those holes drilled effectively for the homeowner or DIYer. They make the job easy. These bits, ranging from 1/4" to 1 3/8" in size, are designed in Ryobi's special X-Wing style that lets you see where you're drilling. Once you've made contact with the wood, you can be sure that it'll anchor itself solidly with a heavy-tipped point which helps maintain stability all the way through the drilling motion. The 3 flat shanks included in this kit help keep your bits stable throughout the drilling, so on top of the weighted tips, you're sure to have a near-perfect cut throughout this bit's lifetime. At the end of the day, you can keep these bits safe in the included bit box that can be stored in a tool box or mounted to a wall with the included brackets. Whether you're the homeowner making a chair leg or a seasoned DIYer building new furniture, these Ryobi bits are an indispensable addition to your accessory collection. 2.It is far safer and more accurate to use this drill bit in a drill press. 3.Processed by the painting, the cutter is water-proof, anti-corrosive, and durable. 4.In design with curve, the head is good at removing the debris and working efficiently. 5.The tip is specially designed to cut through hole cleanly, great for boring concealed hinges and door clocks. 6.Made from carbon HSS steel and being hot-treated, the blade is characterized by high accuracy, smooth cutting.Operation, good resistance to shock and good toughness. 7.It is suitable for cutting holes onto woods.Precision ground for heavy use and easily resharpened, they can enlarge existing holes with ease and can bore any arc of a circle. When you using this drill bit, the materials (eg. wood, plastic products, plywood ect.) temperature will get very high , please add some water or coolant to avoid the material get smoke. Suitable for pistol drill, bench drill, vertical drilling machine hand held electric drill, stand motor-driven drilling machine and mobile ribbon type magnetism drilling machine, etc. 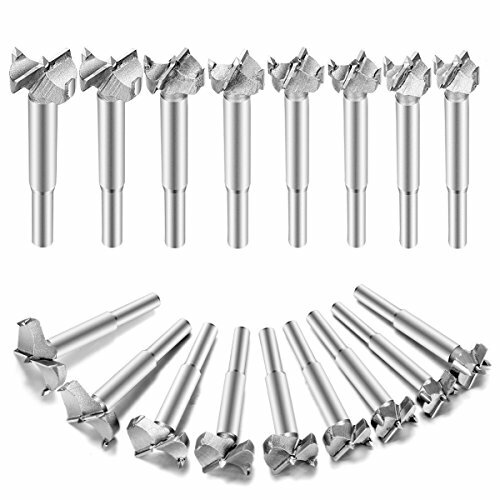 Precision Shear Forstner Bits feature a double-ground, razor-sharp serrated edge that slices throughout the rotation of the bit for less splintering and chipping, producing flawless flat-bottom holes. This unique geometric design has multiple cutting edges that produce greater shearing action, allowing for faster rotational speeds and more efficient cutting. Features 100% brand new and high quality. 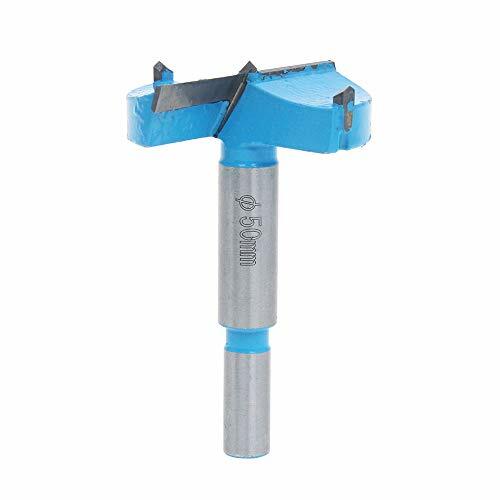 Borer Drill Diameter:50mm(2") Precision ground for heavy use and easily resharpened, they can enlarge existing holes with ease and can bore any arc of a circle. Carbide tip is specially designed to through hole cleanly in end grain and thin stock, great for boring concealed hinges and door clocks. It is far safer and more accurate to use this drill bit in a drill press. 3-35/64-Inch Overall Length, Right-Hand Rotation.